On 4-5 November 2016, delegates from 30 seniors’ associations from 23 European countries gathered for the triennial ESU Congress in the Provinciehuis (Province House) in Leuven. Managing the refugee and migration crisis and guaranteeing security and safety for all citizens. Several inspiring speeches around this theme were held, among others by former European Council President Herman Van Rompuy about ‘The storm and Europe: an inseparable couple’. In addition, greetings were given by Joseph Daul (President EPP), Koen Geens (Belgian Minister of Justice), Wouter Beke (President CD&V) and Chris Taes (Chair of the Provincial Council of Vlaams-Brabant). Sus Bergmans (Interreg Vlaanderen-Nederland) and Marleen Van Hees (director ‘Care’ of Landelijke Thuiszorg) presented regional projects of ‘European support to build inclusive societies’. Apart from the speech of Herman Van Rompuy on Saturday, a panel discussion with Heinz K. Becker (MEP), Benoit Drèze (member of the Walloon Parliament) and Astrid Noklebye Heiberg, (Hoyre – Senior Policies) was moderated by prof. dr. Steven Van Hecke. 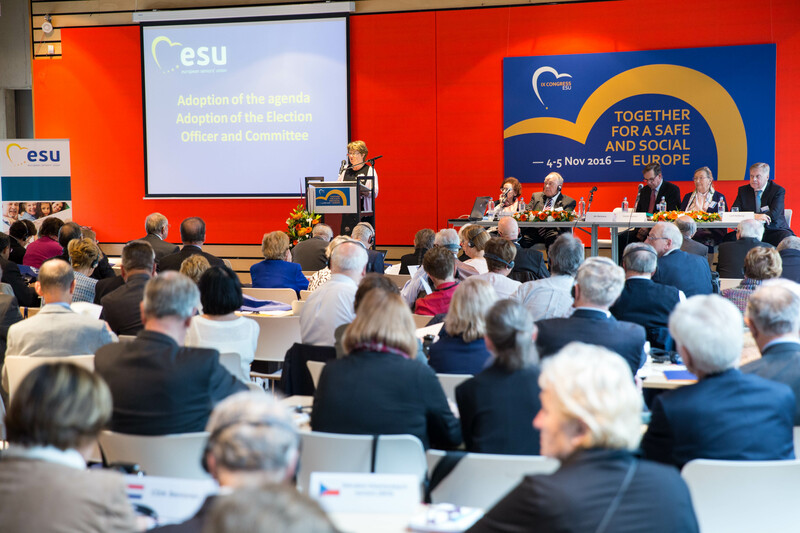 Further, ESU President An Hermans was re-elected, a new Presidium was chosen, Secretary General Guido Dumon and Treasurer Etienne Vanderroost were appointed, and the Leuven Declaration, highlighting the main concerns of seniors all over Europe, was adopted. More pictures and the programme of the Congress can be found below.